"You'll need a skillet to capture all the goodness of this dessert. 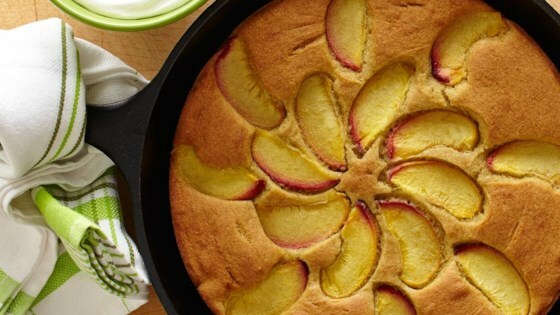 Create the vanilla cake batter using gluten-free sorghum flour, arrange the peach slices on top and bake to a golden brown. A dollop of whipping cream adds to the yum factor." Preheat oven to 350 degrees F. Prepare a 10-inch, ovenproof skillet with cooking spray. Whisk together sorghum flour, baking powder, baking soda and salt. Set aside. In separate bowl, beat butter and sugar with a mixer on medium speed until light and fluffy. Add vanilla. Beat in eggs and buttermilk. Add dry ingredients and mix until blended. Pour batter into prepared skillet. Place peach slices in spiral fan on top. Sprinkle with cinnamon sugar. Bake until golden brown and a toothpick inserted in the center comes out clean, 30 to 35 minutes. The batter bakes up around the peaches. Let cool slightly before serving. Cake can be served as rustic dessert topped with whipped cream sweetened with sorghum syrup or as a breakfast cake.